Been involved in a car crash? 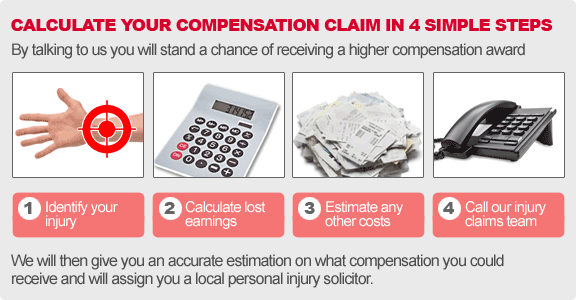 Want to make a personal injury claim? We are one of the leading no win no fee* claims websites in the UK, and can give you a very quick and immediate estimate on how much personal injury compensation you could receive for a car accident. Don’t Lose Out – Call us for No Win No Fee* Car Crash Claims – You will need to call us today as this will mean we have a better chance of winning a higher compensation award. Compensation calculators for a car accident will typically give you a lower valuation than you actually deserve. Our solicitors win very high personal injury claims. The reason that we don’t have an online car accident compensation calculator for you to use is because they tend to under-value your car accident claim. Instead, we ask all new clients to telephone our Freephone number for a free no-obligation discussion on your accident. We will then tell you over the phone how much you can expect to receive, which will typically be more than an online car accident claims calculator will show you. So don’t settle for second best – call us now for advice on your car crash claim and let us assist you through the process of getting the personal injury compensation that you deserve. The route to getting a UK personal injury award with our solicitors and lawyers involve us doing some quick mathematics. Our car crash compensation calculator logic is produced after we put two numbers together. These are firstly “general damages” which are standard award fees that are dictated by the Judicial Board Guidelines. These will be set according to the type of injury that you suffered in your car crash or accident. The next number is called “special damages” – this will include any expenses that you have incurred such as travel costs, care, medical attention – in fact anything that you have had to pay for due to your personal injury. As an accident claims company, we realise how essential it is for people to know what their potential compensation award is going to be. It’s puts you at the peace of mind of knowing that every will be ok in terms of your finances, and support that you need in stressful times. That’s why we don’t rely on an automated car injury compensation calculator which you can complete online… we prefer to talk to you in person so that we can get as much detail as possible before committing to a number with you. We don’t have an online car accident injury claim calculator because they don’t give accurate results – call us for an estimate so you receive the most money for you injury. Because we prefer to speak to you in person it means that we are able to give better estimates, which will most of the time be far higher than the ones you would get from using a car injury compensation calculator. Once you have talked with one of our personal injury specialists, you will then have a far better idea of whether or not you would like to proceed with legal action – please note that we work on a no win no fee* agreement meaning your financial risk is completely mitigated regarding car accident personal injury claims. The amount of car accident compensation that we calculate for you will depend on various factors including how long it took you to recover, the severity of your injuries, any costs that you accrued, and if you have had to have time off work. Here’s our short video about the process, which you can also watch on YouTube. We cannot give an exact figure until such time that any medical records have been examined, but we can give you some reasonably accurate calculations with the information that you give us over the telephone. If you would like to get started and talk to one of our experts then get in touch now and we will talk you thought the entire car accident compensation calculator process. If there is case to answer you will then be assigned a personal injury solicitor local to you who specialises in car accident compensation claims. We are very pleased to recommend and support two road safety charities which help people to recover from car crashes, as well as raising awareness of the potential dangers of road usage on the UK and Britain’s roads. Please visit their websites to find out more.